The use case shows how to automatically fix the implementation netlist to make it equal to the reference netlist. The "fix_design" command runs an Equivalence Check on the top module and its sub-modules between the implementation and reference netlist. Non-equivalent points are located. 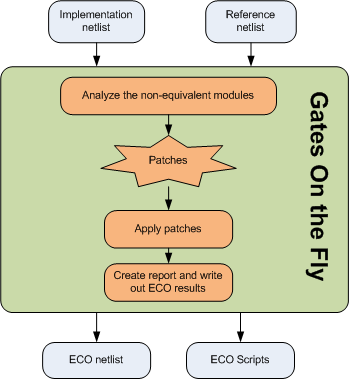 A minimum number of gate patch is created and applied to the implementation netlist to make it equal to the reference netlist. The internal Logic Equivalent Check engine finds and analyzes the non-equivalent modules and figures out the minimum logic patches to fix the Implementation netlist.